January 4, 2015 by David Shields. Average Reading Time: about 7 minutes. Kelly, Rob Roy. 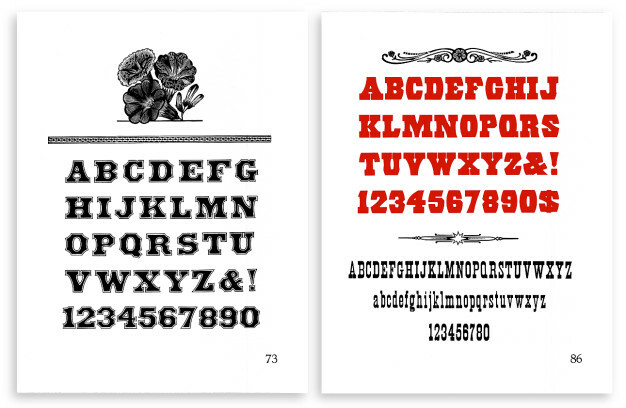 Wood type; specimens of nineteenth-century American wood type with introductory notes. Kansas City, Mo: Rob Roy Kelly, 1964. Print. Issued in a tan buckram covered solander box with printed paper label on front cover, titled: Wood type; specimens of nineteenth-century American wood type with introductory notes. 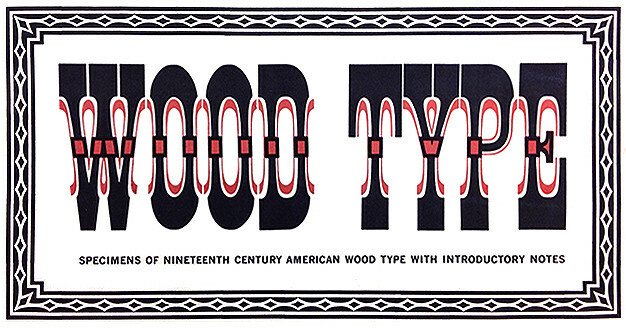 Consists of introductory notes and index bound in printed paper wrappers with black plastic spiral spine titled: American Wood Types 1828–1900, Volume One; 95 loose broadside plates, numbered, displaying 130 complete alphabets, some printed in black and red, and 2 additional unnumbered leaves showing some wood cuts used in that period. Text by Rob Roy Kelly, with editing by Georgia O‘Connor. Part of the text was previously published in Design Quarterly 56, Walker Art Center, Minneapolis, Minnesota. 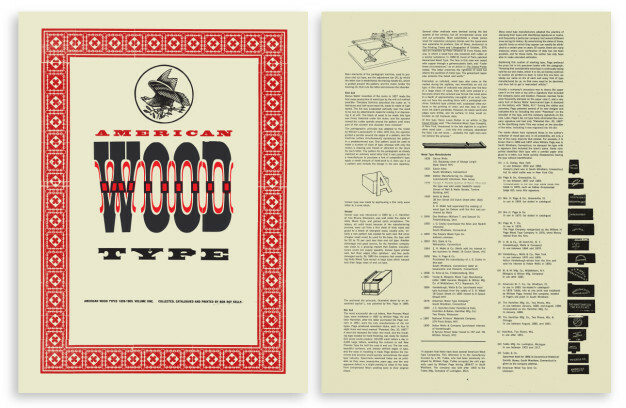 Limited edition of 45 copies pulled on a hand press from wooden type. 35 copies distributed by the Chiswick Book Shop, 45 West 57th Street, New York City. Final versions of folio page 1 (left) and page 45 (right). Of the 45 numbered copies produced, 30 are held in known locations documented as follows. The bibliographic descriptions and library call numbers are copied from each institution. Acquisition information is included where known. Unlocated folio numbers marked in red. p.,  leaves of plates : ill. ; 58 cm. p., plus 97 plates, in portfolio. 6 leaves : ill., 97 plates ; 57.3 cm. p., 95,  leaves of plates : ill. (woodcuts) ; 60 cm. 7 leaves, 97 specimen sheets ; 57 cm. p., 97 leaves of plates (some col.) ; 61 cm. 1 portfolio ( p., 95,  leaves of plates : ill.) ; 60 cm. p.,  leaves of plates : ill. (some col.) ; 60 cm. p., 97 leaves of plates (some col.) ; 61cm. v. illus., plates.Issued in portfolio. p., 95,  leaves of plates : plates ; 60 cm. pages, 97 leaves of plates (some color) ; 61 cm..
6 . : ill., 97 plates ; 57.3 cm. This volume was originally held in the Technology & Science Dept of the DPL. Purchase gift of Friends of the Detroit Public Library and was presented by the James B Tintbra Family In Memory of John F Polakovic. 6 ℓ. : ill., 97 plates ; 57.3 cm. Final versions of fly sheet (left) and index page (right). In addition to this list of 30 identified copies, locations of at least two complete folios have been narrowed though not yet confirmed. 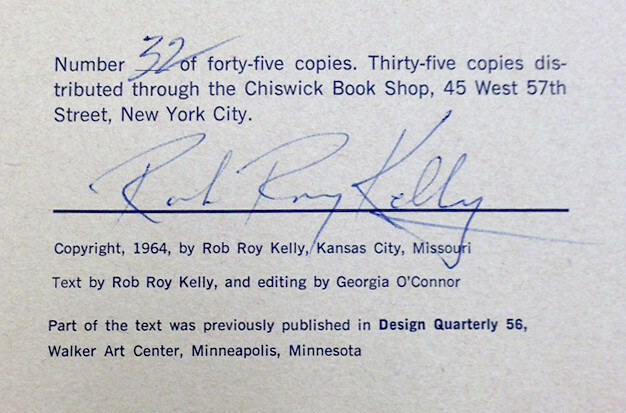 Correspondence between Rob Roy Kelly and the Kansas City Art Institute (KCAI) dated September 8, 19641 indicated that Kelly donated a full folio to KCAI. Further research is needed as this folio is not included in KCAI’s online library catalog and the correspondence, unfortunately, does not indicate the edition number of Kelly’s donation. It has not yet been confirmed if the institution still holds a copy. Information found online indicates that Swann Auction Galleries of New York City actioned a complete signed copy on June 4, 1998 (Lot 3) but do not indicate the number of the edition. They have not yet responded to inquiries for more information in regards to this transaction. Final versions of folio page 73 (left) and page 86 (right). In addition to the 45 complete folios, it seems smaller truncated sets were also made and distributed that included the pages of introductory text and index bound in printed paper wrappers with black plastic spiral spine and include three of the numbered broadside plates bound with the text. Four of these sets have been located. Special Collections Library at the University of Kentucky holds a set with plates 70, 82 and 85 (Folio Collection 655.24 K298 Folio 344). Special Collections at the University of Buffalo Library holds a set with plates 14, 29 and 71 (Rare Books Oversize Z250.A2 K35 1964). The Milne Library at the State University of New York, Geneseo holds a set with plates 49, 57 and 58 (Special Collections X Z250.A2 K39, v.1). 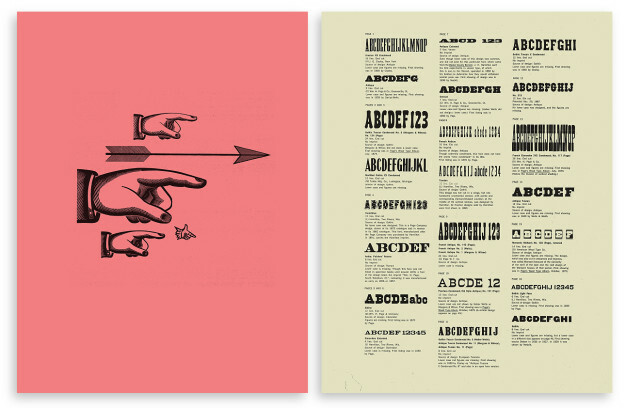 The Cary Graphic Arts Collection at Rochester Institute of Technology, in addition to No 44 noted above, also holds a truncated set with plates numbered 66, 72 and 73. Michael Babcock at interrobang letterpress holds a set with plates 18, 32 and 69. The University of California, Santa Cruz, UCSC Library holds the 12-page introductory text and index bound in printed paper wrappers with black plastic spiral spine (Spec Coll Oversize Z250 .K45 1964). No plates are included. Barbara Farnsworth, Bookseller, A.B.A.A. (West Cornwall, Connecticut) had a set for sale that included plates 29, 46 and 56. It is my hope that with the publication of this list, locations of the remaining complete folio may come to light. 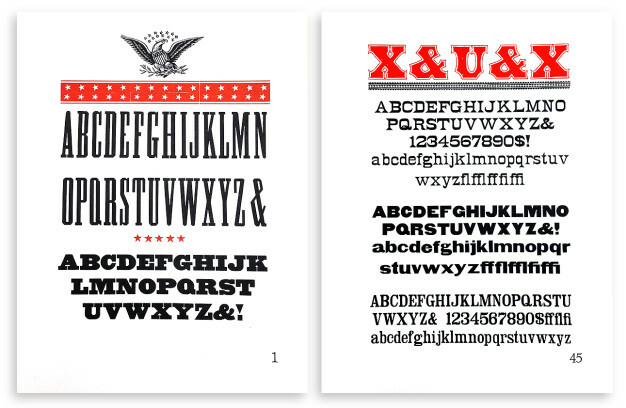 Final versions of bound cover (left) and text page (right).